As the days count down to the start of the 2019 MLB season, what is there to get excited about when you talk about the Seattle Mariners? Unfortunately for me, not much. General manager Jerry Dipoto retooled 90 percent of last year’s roster, and most all of the familiar faces have been traded or released. Gone from the roster are James Paxton, Robinson Cano, Nelson Cruz, Jean Segura and All-Star closer, Edwin Diaz. That is a lot of baseball talent playing elsewhere this season. How then are fans expected to get behind this team? “It’s a step backward in our journey for greatness,” we’re told. What the hell does that mean? I guess the lack of success calls for drastic measures apparently. But did every watchable player need to disappear? Give the fans at least a little something to watch while this experiment unfolds. Good luck selling tickets this year. This could be a truly embarrassing season attendance-wise. A rainy Tuesday night in June when this no-name team is already smelling Houston’s dust doesn’t really translate into big crowds. That is a lot of bobblehead dolls to sell to fill seats. If you listen to the team, fans should be excited about the new and improved bodies that Felix Hernandez, Dee Gordon, and Kyle Seager bring to Arizona for the preseason. Haven’t we heard that before? They’re eating better, lost weight, gained muscle, and are actually healthy. This will finally be their season. Really? Seager and Hernandez are coming off their worst seasons ever. Hernandez had an 8-14 record with a 5.55 earned run average and got demoted to the bullpen midseason. He is just 24-27 over the past three seasons as fans have watched him steadily decline from his all-star status when he earned the nickname The King. 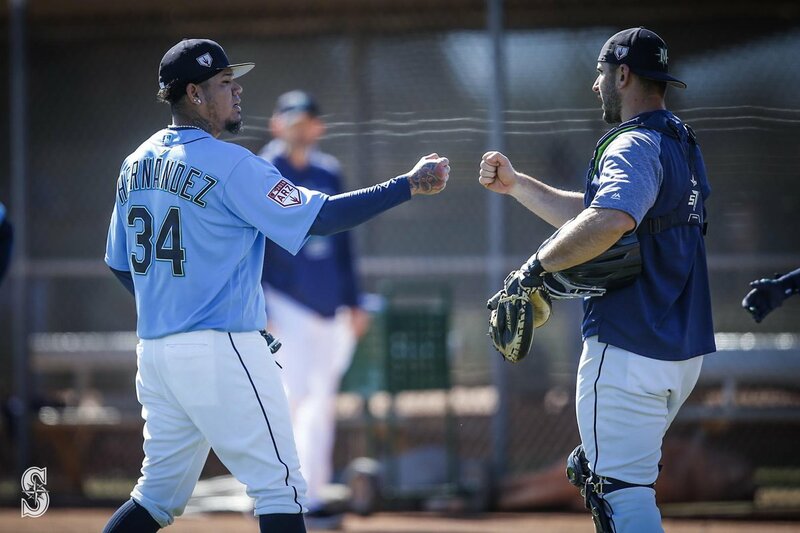 For the second straight spring training he arrived “in the best shape of [his]career.” Having traded most all of the starting pitching talent from last season, the M’s are forced to roll out a 32-year-old pitcher and his $27 million contract. Does that get you pumped? Kyle Seager would have been benched by most teams last season as he continued his downward career spiral. He had a .221 average with 22 home runs and a .273 on-base percentage, by far the worst season of his career. He battled toe and back issues all season and was a liability on defense with 14 errors (50 in the last three seasons). After an offseason of eating right, losing weight, and gaining muscle, Seager is now supposed to excite us as the starting 3rd basemen again? I think his $19 million salary has more to do with his spot in the lineup than his new body. Fans have been waiting to witness a breakout season and to see him live up to expectations. At 31 and in a three-season statistical decline, Seager is virtually doomed. Dee Gordon was Mr. Utility in 2018, bouncing around second base, center field, and even shortstop. We’re now told his decline was due to feet and toe issues that never healed during the season. He couldn’t run properly, and it affected his fielding and especially his swing at the plate. He had a career-low season, batting .268 with a .288 OBP and stealing just 30 bases. Do you see the pattern here? It just doesn’t generate much room for enthusiasm. If those three can indeed stay healthy and drastically improve their poor performances from last year, there may be a glimmer of hope, however. There are tons of question marks about most all the young players making up this year’s roster. But hopes are high for the likes of Mitch Haniger, pitcher Marco Gonzales, and the team’s no. 1 prospect, Justus Sheffield. The optimist in me hopes this “retooling” year will generate some flashes of excitement. But the pessimist in me is so jaded from the past 18 years of getting kicked in the stomach repeatedly, that everything points to a very unfulfilling season. AGAIN.